Use the Income & Expense statement to view your net income over a date range. 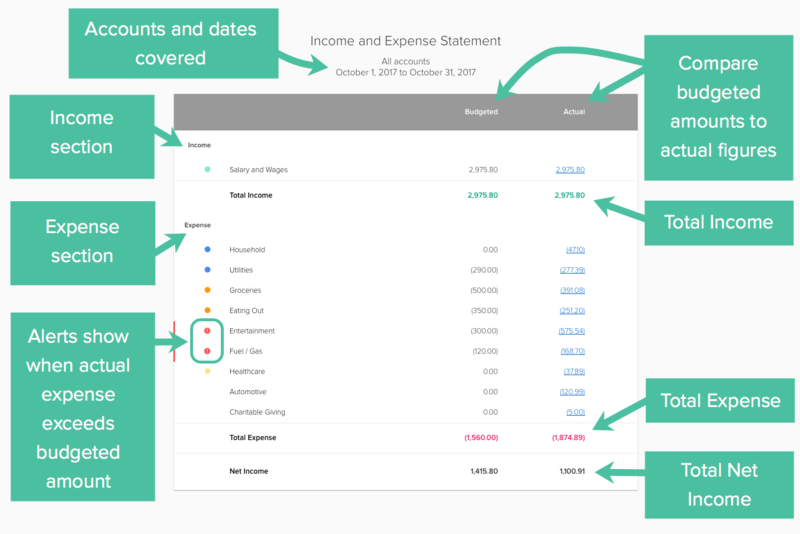 The statement shows a breakdown of your income and expenses into categories and allows you to compare your budgeted spending side-by-side with your actual spending. You can customize the Income & Expense statement to reflect the particular information you would like to report on. Change the date range, select a specific account, and include or exclude transfer transactions - the choice is yours! The date picker allows you to select the date range to be displayed on the Income & Expense statement. To change the date, click on the date range displayed in the toolbar and select from any of the default values or enter a custom range using the drop-down menu. The side panel allows you to choose to view the Income & Expense statement for all accounts, a single account, or a selection of accounts. To view all accounts, just click All accounts. You can download an Excel (XLSX) or Generic (CSV) file detailing all of the transactions that contribute to the Income & Expense statement. Simply click on Download transaction report in the toolbar and select the file type you would like. How do I hide a category from the Income & Expense Statement? 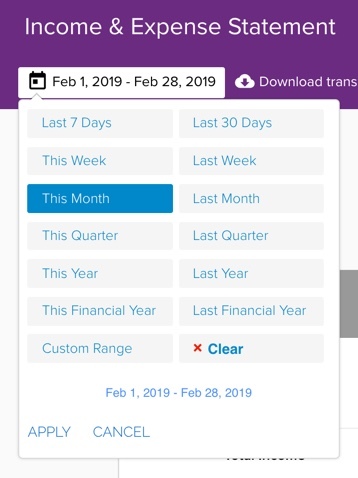 Hide a category from your Income & Expense Statement by navigating to the category you would like to hide, and hover over the far right of the category row. Click on the crossed eye icon that appears. Why is there a category missing from the Income & Expense statement that I did not hide?